When the global financial crisis erupted in 2008, one oft-cited fear was that factory layoffs in China would lead to social unrest. That didn't happen, in part because Chinese workers proved willing to endure stagnant wages and unemployment as the national economy slowed. But now that Chinese growth has rebounded, workers aren't so patient. In recent weeks, Honda has seen a series of strikes at its Chinese factories and suppliers. The Japanese automaker resolved a two-week work stoppage at a transmission plant in the southern city of Foshan on June 4 after offering a 24% pay increase. That was followed this week by workers walking off the line at an exhaust parts factory in Foshan that is partly owned by a Honda subsidiary. Employees have since returned to work at that plant, Foshan Fengfu, after an undisclosed agreement was reached, a Honda spokeswoman in Tokyo said. 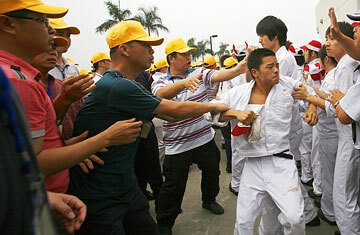 But another strike at a Honda joint venture that produces automobile locks in Zhongshan, Guangdong, is continuing. The troubles aren't Honda's alone. In Kunshan, a city near Shanghai, 50 workers were injured on June 7 in a clash with security guards, the state-run China Daily reported, after 2,000 people went on strike at KOK Industrial, a Taiwanese-owned factory that produces rubber products. While China's recent growth has been strong, especially when compared with the U.S., Japan and Europe, it faces the prospect of rising strife as workers demand higher wages and better working conditions. "You tend to see more labor unrest in economic boom times than economic downturns, which sounds strange," says Geoffrey Crothall of the China Labour Bulletin, a Hong Kong-based NGO. While workers may have been willing to give their bosses the benefit of the doubt during the 2009 downturn and accept low wages or pay cuts, now, says Crothall, times have changed. "The economy is booming again and the same workers are forced to work longer hours, but pay is same. Obviously they are angry and frustrated." Foxconn, a Taiwanese company that manufactures electronics for Apple, Hewlett-Packard, Sony, Dell and others, announced a 30% increase in base wages on June 1 after a string of suicides this year at its Chinese factories. The company has 420,000 workers at its plants in the southern manufacturing center of Shenzhen, where nine workers have died after jumping from buildings this year and two more have injured themselves in suicide attempts. Another jumped to his death at a Foxconn factory in Hebei in January. On June 6 the company announced some workers in Shenzhen would see their base salaries rise this fall to 2,000 renminbi ($290), an increase of about 60% over the previously announced wage hike. This year about 30 Chinese cities and provinces have increased or are expected to increase their minimum wages as coastal regions try to attract and retain workers. The wage hikes have been years in the making, says Ben Simpfendorfer, chief China economist for the Royal Bank of Scotland. "It's a resumption of a trend that first emerged in 2004," he says. "The economic crisis delayed it temporarily, but didn't eliminate it." The recovery of both domestic and external demand has helped drive up salaries. At the same time, China's $586 billion stimulus package helped boost infrastructure development in interior provinces that have traditionally lagged economically. That's kept some workers from traveling to coastal manufacturing regions for work. And while China has a huge labor pool, factories and construction sites favor workers in their 20s. That population will decline in the coming years, putting further pressure on wages. In the short run, the wage increases will strain Chinese exporters who often subsist on narrow profit margins. But that should have benefits for the country's overall economy. "You're already seeing low-cost producers going out of business. That's a good thing," says Simpfendorfer. "This isn't a business [China] wants to be in." Rising wages will also ultimately help China increase domestic consumption, which the government says it wants to become a more important driver of economic growth. At the same time the rest of the world will have to get used to higher prices on Chinese-made goods. For the time being there are few signs that China's trade partners have found a suitable substitute for cheap imports; meanwhile, the value of Chinese exports in May grew 48%. If you're working at a Chinese factory, that's another reason to ask for a little more cash.